“Sometimes the questions are complicated and the answers are simple” – Dr. Seuss. 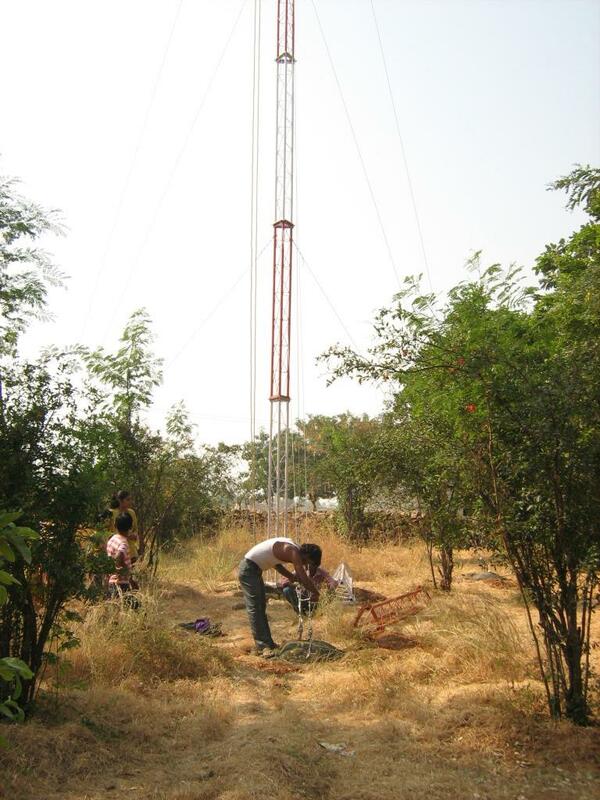 Watch it Unfold – Deploying Last Mile Connectivity at Adharshila! 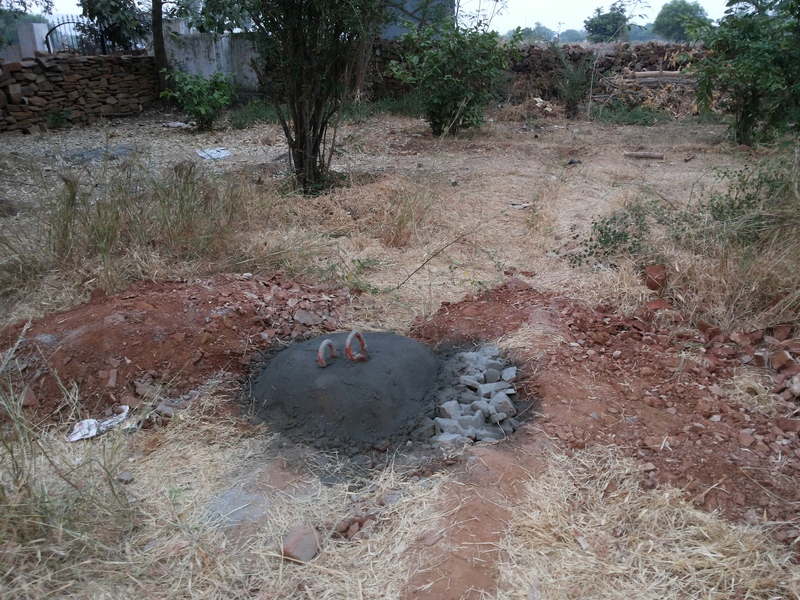 Adharshila school is located in district Sheopur, in the state Madhya Pradesh in India, approximately 180km from Gwalior city. 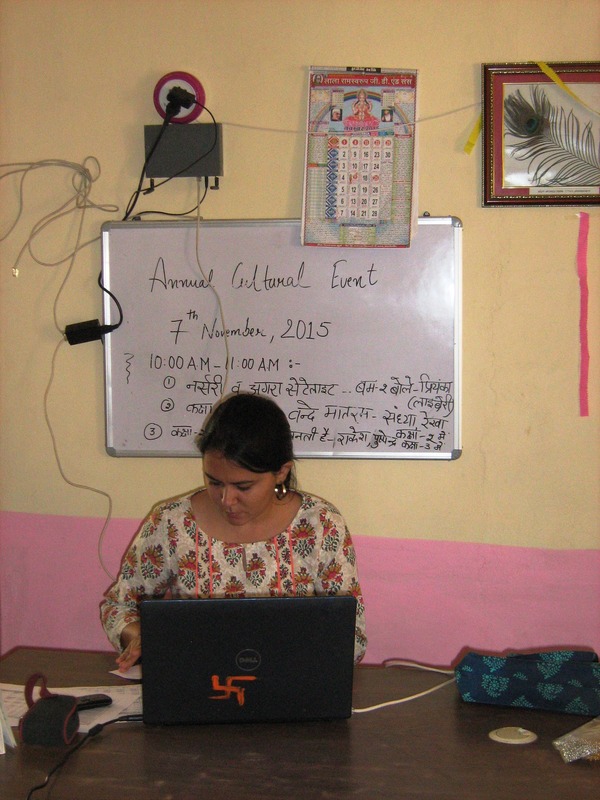 Without internet access people in Adharshila are cut off from anything that does not occur in their village. Additionally weak internet connectivity is a significant barrier to introducing higher quality of education in remote villages in India. Solving the connectivity issue will provide opportunities for asynchronous learning, easy accessibility to information, and higher education quality at an affordable cost. 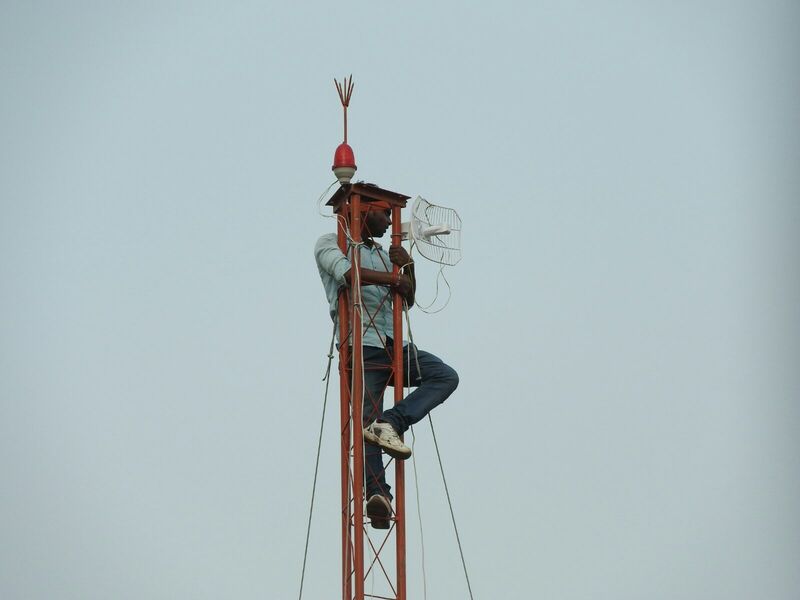 After a year and half of unsuccessfully chasing Reliance, Sify, Airtel and other major telecoms in India, to provide last mile connectivity to remote villages, a local company, Texes Telecom, came through for us like a knight in shining armor! Texes Telecom is a provider of telecom and infrastructure services in India and a registered vendor of Reliance Communications. They have accomplished in less than a month what other major telecoms have failed to deliver in a year! 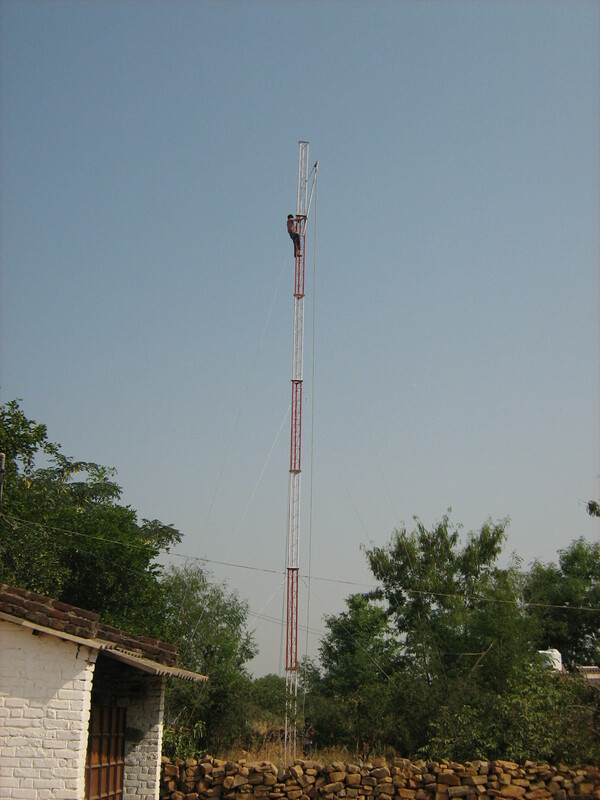 Week 1 – A 24 meter RF tower is erected near Adharshila school in the village of Agraa. 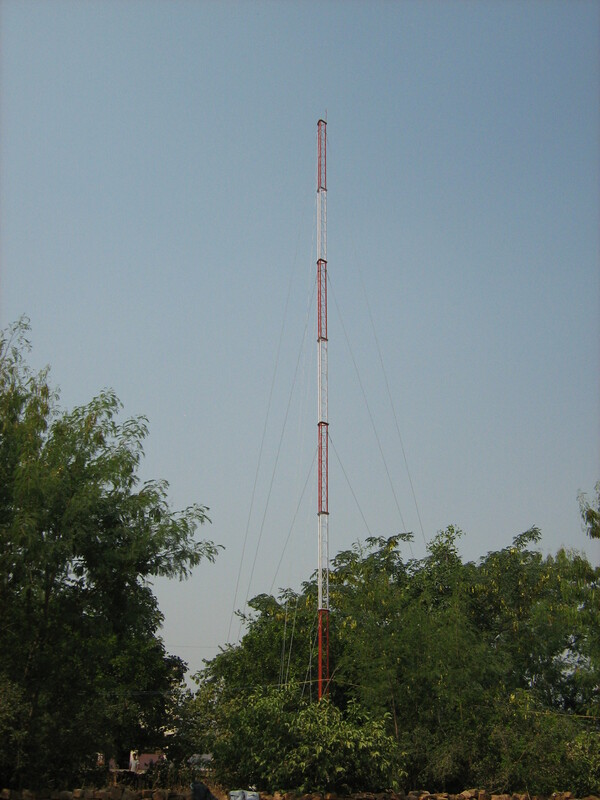 The tower will receive signal from the Reliance tower at Umri Kalan. 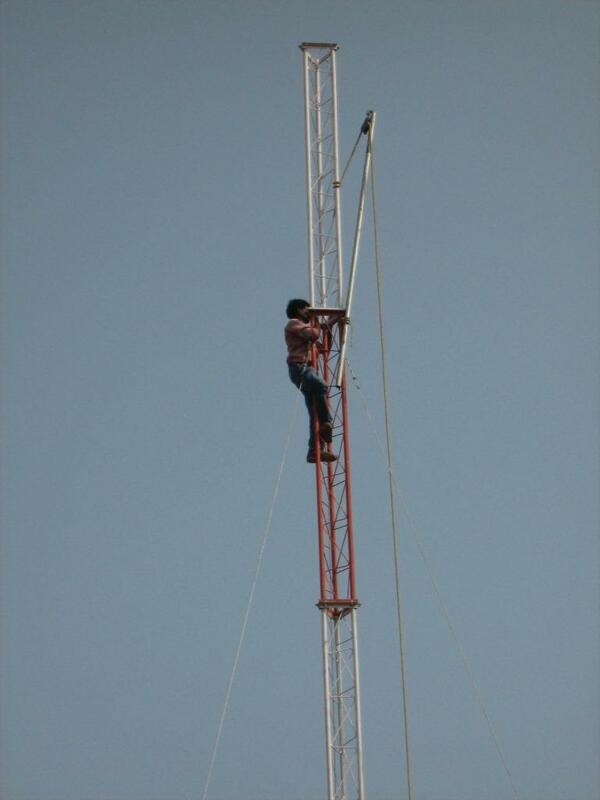 Week 2 – Technicians from Reliance have clear line of sight to the tower at Umri Kalan and the signal is strong! Week 3 – HOME RUN!! We (almost) have internet connectivity!! Connectivity lasted long enough to test-run a video Skype session between Delhi and Adharshila. We lost connectivity because the batteries running the BTS at Umri were discharged due to a power outage in the area for 2 days. Waiting for Reliance to fix the problem. Week 4 – “Hello World”! 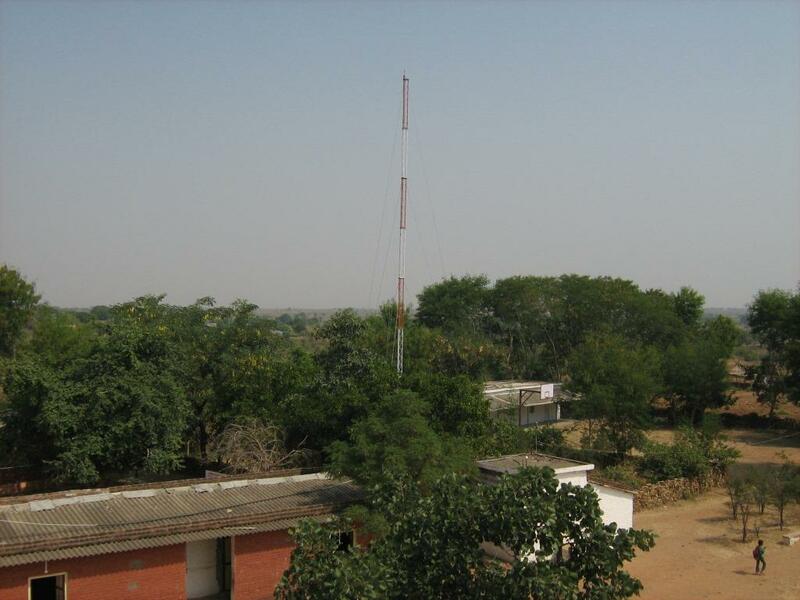 Adharshila, an area forgotten by the major telecoms in India and where people used their phones mainly as MP3 players, is now on the cellular grid and ready to change the world! 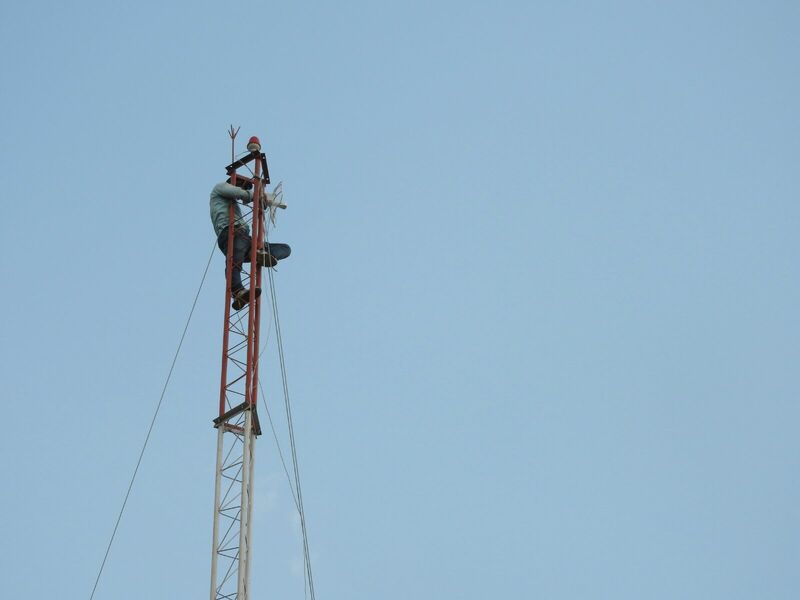 The hard part begins now … ensuring Reliance provides reliable connectivity, the local infrastructure company provides support in case of equipment failure and finding content in the local language. 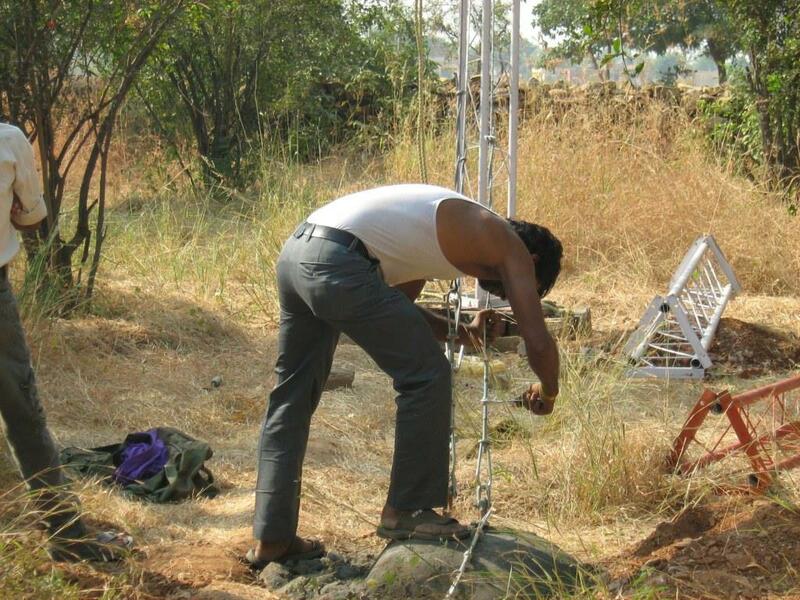 Weak Internet connectivity is a significant barrier to introducing higher quality of education in remote villages in rural parts of India. Solving the connectivity issue will provide opportunities for asynchronous learning, easy accessibility to information, and higher education quality at an affordable cost. 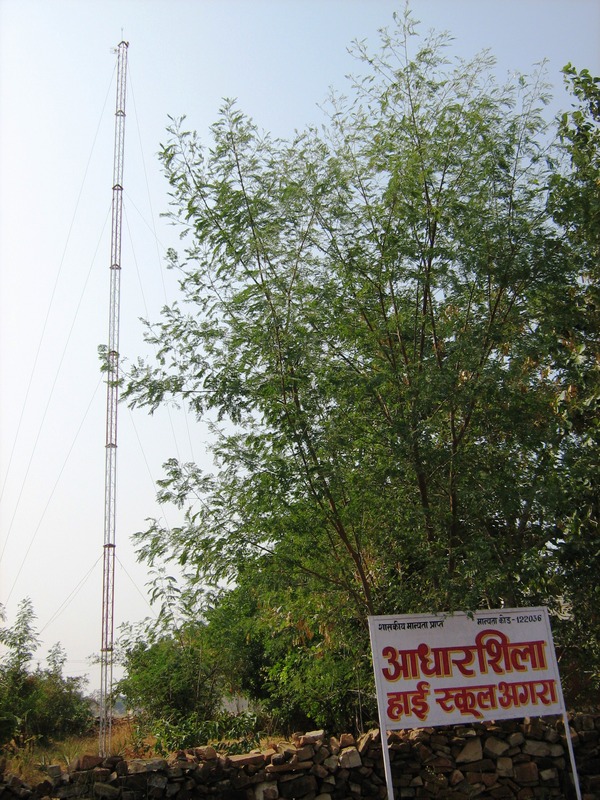 Broadband connectivity will allow students and teachers in schools such as Adharshila, located in district Sheopur in Madya Pradesh, approximately 180km from Gwalior the ability to access email and the internet. Availability of broadband connectivity will also provide the infrastructure to conduct remote teaching through video sessions as well as explore possibilities with remote healthcare. Streaming video, required for real time interactive remote classroom instruction, requires a reliable, fast internet connection, one that supports on the order of 2Mbps (Megabits per second)– 6Mbps transmission speeds. To provide some context of what this means, a typical “3G” cell phone network offers speeds up to 2.5 Mbps and the more advanced 4G networks provide between 7 and 20 Mbps network speeds, the speeds being greatly affected by the presence of physical structures such as buildings, hills and other physical topographies that act as barriers to the “line-of-sight” required between the cell tower(s) and the user’s mobile phones. The network speeds in a region are also greatly impacted by the absence or presence of cell towers in that region; the further apart the towers are placed, the weaker the signal between them becomes, resulting in slower network speeds available for use. 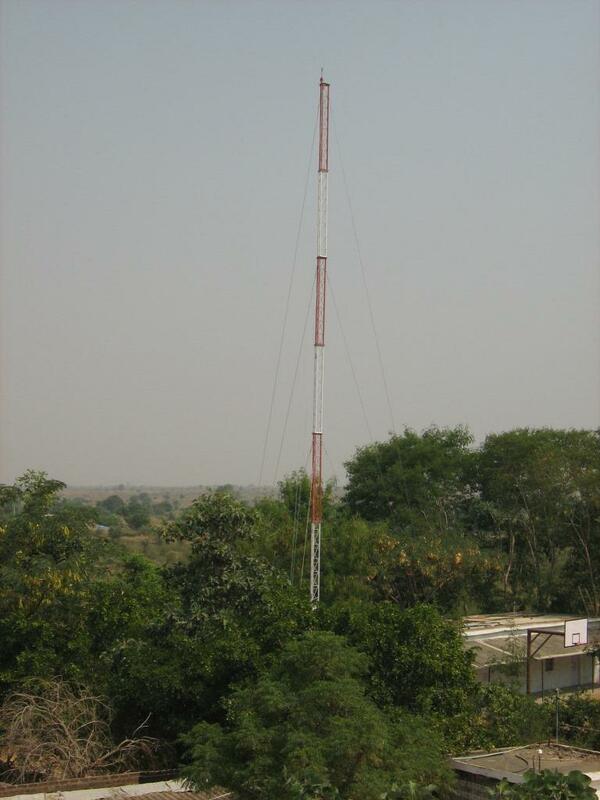 In rural India – and this is especially true in the remote region of the country in which Adharshila is located – cell phone towers are spaced as far apart as they can be to just be able to provide low-bandwidth, voice and SMS communications. 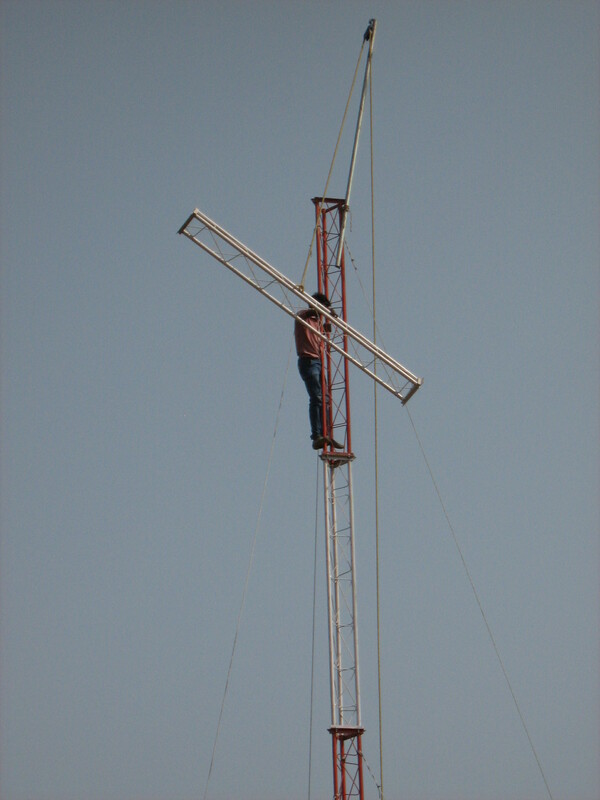 This how telecommunications companies have been able to make their costly investments in cell towers economically viable in these low income, low population density rural areas. 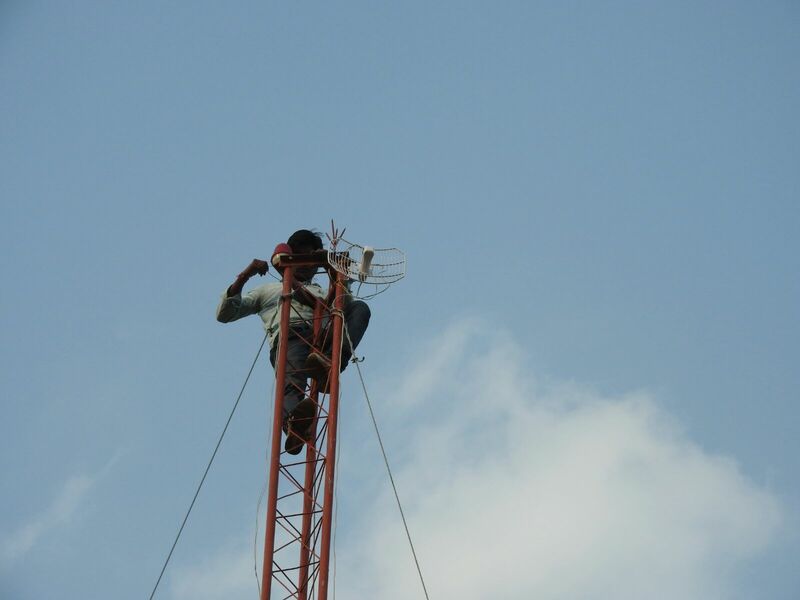 Over the past year, we have engaged several of the largest cellular telecommunications service providers in India to assess the feasibility of providing us with cellular network based internet connectivity at Adharshila. These companies are household names as cellular service providers in India, including Reliance, Airtel, iDEA, and TATA. 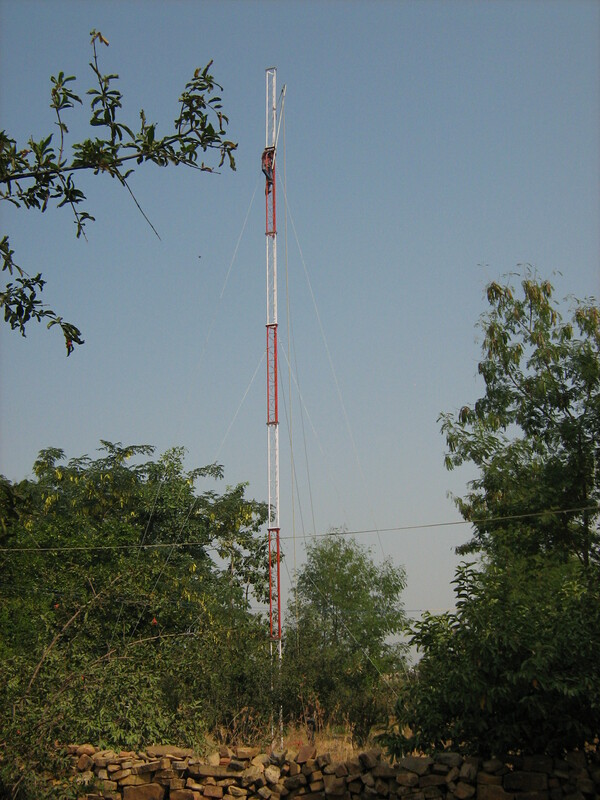 We even engaged a service provider – Sify Communications – that specializes in rural area communications. However owing to the extreme rural location of the school, none of these providers were able to provide connectivity with the bandwidth and reliability required for our needs. 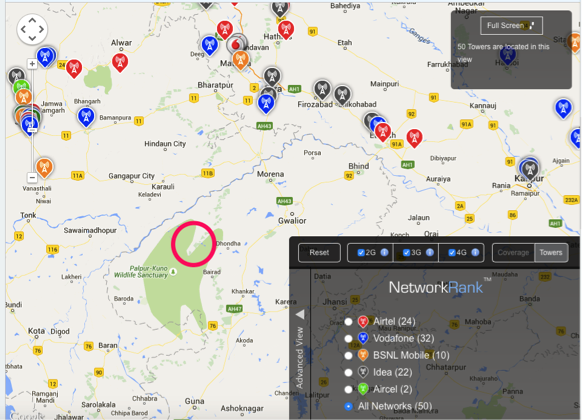 To further illustrate the point, the cell tower coverage map above shows that Adharshila, located inside the red circle, has no cell towers in the vicinity hence providing broadband connectivity to Adharshila using ground-based cell towers is not an option. Despite these initial disappointments, we are pursuing another option to provide internet connectivity to the school. We have begun an evaluation of geo-stationary satellite based internet connectivity, the so-called VSAT network connectivity. VSAT connections are slower than ground-based cellular connections and cost more to use. On their own, they wouldn’t suffice for the streaming video needs of the school. However, we have found a service option that uses advanced video compression techniques that allows relatively high quality video to be run in real time over a relatively low speed network connection. 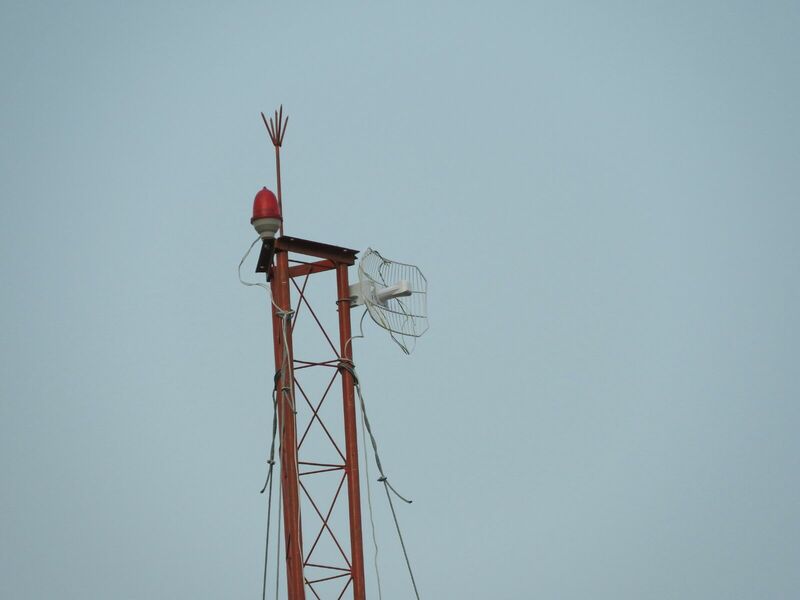 As of this writing, we are working with the two entities that provide these two services, VSAT and video compression, to evaluate the feasibility of putting them together to service Adharshila’s needs. 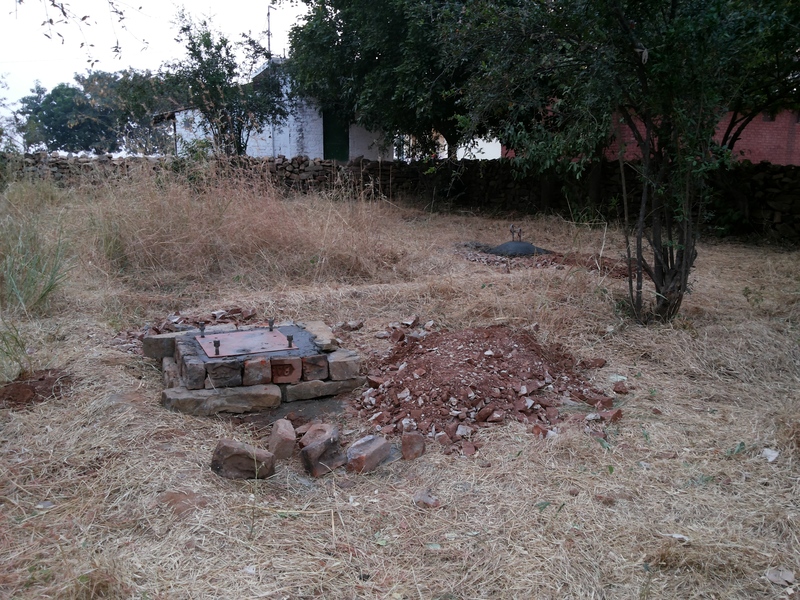 The assessment should be completed by the end of September 2015. I read this sometime back and could not have said it any better …. 1. MDM is Not Just for Large Organizations – Ever felt helpless when you know your kid(s) have sneaked in the smartphone / tablet and are playing video games under the comforter in the night? Enter Mobile Device Management (MDM) for parents! the MDM platform will allow you to block URL’s, find your child, track activity, have a family app store and control when devices are used. While it may seem a little big-brother like, better safe than sorry. Can’t wait to get this soon enough! http://www.zdnet.com/mdm-for-parents-you-want-it-too-7000022292/. 2. Car of the Future – At a time when we are experimenting with driverless cars and connected cars http://www.citeworld.com/consumerization/22717/your-car-will-be-big-data-collector-every-time-you-drive why is it that having a holder with a built-in charger for my smartphone which seamlessly projects to the screen in the car and allows me to listen to Pandora through the car speakers is not mainstream, but part of a ‘technology package’ which requires an extra fee and has a clunky interface? Imagine this for the car of the future – as I sit in the drivers seat, the car knows its me driving instead of my husband – the seat, mirrors, temperature,seat warmers, music channels automatically adjust, my smartphone connects seamlessly and greets me personally, I speak and tell it where I am going and turn-by-turn navigation map displays on the car screen. Its not too far-fetched and very doable … the key is having ‘connected ecosystems’. 3. Future of Streaming Content : Netflix – please,please improve the content in 2014. The best userinterface http://www.huffingtonpost.com/2013/11/13/netflix-redesign_n_4262877.html, multi-channel experience and search algorithm will not keep users on Netflix. If content is not improved in 2014 and you may just drive us to using Amazon Instant, Redbox Instant or whatever is the latest streaming content platform. Also please buy rights in other countries, we feel a little lost without our daily dose of movies and shows when we travel. 4. One Integrated System to Manage Social Content : Have one integrated system to manage posting content, replies, notifications and engagement across various social sites such as LinkedIn, Facebook, WordPress, Twitter, Quora (does anyone still use this?? ), Google+, Medium with an easy-to-use interface, and groups / security / authentication / profiles working seamlessly across these systems. 5. Wearable Technology and Digital Health – will it always be 5 years away? Is there a market for it? There has been a lot of talk about smart watches and smart glasses making the frontier of wearable tech. Bloomberg is even talking about a smart wig! http://www.bloomberg.com/news/2013-11-26/sony-seeks-smartwig-patent-for-hairpieces-with-camera-sensors.html. Agreed that prototypes available today like Goggle Glass make us look a little dorky and don’t seamlessly fit in with our current lifestyle. Activity trackers are a good start but until FDA relaxes its stringent guidelines they will simply be dumb trackers of our activity and not elevated to intelligent devices which can predict (as an example) the onset of a heart-attack and inform the doctor in advance http://www.youtube.com/watch_popup?v=r13uYs7jglg. That being said I do believe that wearable Technology and Digital Health will go mainstream PROVIDED we are able to create ‘connected ecosystems’ and integrate ‘systems of record’ with ‘systems of engagement’ which in-turn will improve the overall experience. 6. Rise of the Chief Digital Officer (CDO) : Progressive companies will realize role differentiation between CMO, CIO and CDO. The CMO will drive brand management and communications, the CIO will focus on technology selection and deployment and the CDO will be responsible for identifying trends and impact of business – technology convergence, creating digital capabilities roadmap and identifying convergence and integration opportunities. #BreakingBad season 6 is not on Netflix as yet and #HouseofCards season 2 will not be on until Feb 14. Looking forward to better content on #Netflix in 2014. #HappyNewYear! Over the last several years I have learned a thing or two about what it takes to start and sustain a digital practice – I have joined companies to start their Digital Practice as well as started my own Digital Practice and along the way I have made assumptions (often incorrectly), not asked the ‘right’ questions and taken missteps. Hopefully this post will help you assess the opportunity as you look to start your own Digital Practice or join one. 1. What is Digital Strategy? If you are reading this post you have probably heard your fair share of definitions for Digital Strategy, here is mine – “Digital Strategy is building holistic multi-channel strategies to drive business growth and productivity by aligning business and technology initiatives, defining governance models and best practices, establishing a digital center of excellence, identifying convergence, integration and process changes – all geared towards personalizing the experience for the ‘connected’ customer and advancing self-service opportunities”. I’ll be the first to admit that the definition is a mouthful and it will continue to evolve overtime, however in my perspective it captures the ‘what’, ‘how’, ‘whom’ and ‘why’ of digital strategy. 2. Is the Sales Team On-Board? 3) Does the Account Team at the Client Site Understand Digital Strategy? It is very likely that while the client is looking for Digital Strategy skills, the position is NOT advertised as a ‘Digital Strategy’ position – the team at the client site will need to understand the ‘true needs’ and advise the client on hiring someone with business, technology, process and innovation background who is equipped to ask the ‘right’ questions and connect the dots to successfully align business and technology roadmaps and prioritize opportunities in the mobile, social, web and streaming media space. 4) Where Does Digital Strategy Fit in the Company Functional Organization? Does the company consider Digital Strategy to be the same as business strategy, IT strategy, marketing strategy or perhaps even creative strategy? Is there a turf war within the organization on who owns digital? The company will need to recognize that digital (including mobile and social) are horizontal capabilities and while rest of the organization might be organized by function, digital capability need to span functional silos. At a more tactical level this will also determine staffing for digital projects. 5) Is There a Go-To Market Strategy? Is there consensus within the organization on a go-to market strategy which clearly describes a plan for acquiring digital customers as well as converting existing clients into digital clients (if possible)? Is there consensus within the organization on the approach that will be followed, marketing collateral that will be used, percentage of the overall company revenue that come from digital initiatives and the plan to grow this percentage? To build the Go-To Market Strategy it takes someone who can clearly articulate the impact of ‘going digital’ and can advise on convergence of business and technology. Additional details on the impact of ‘going digital’ are available on my blog post http://bit.ly/17DpTuw. Digital strategy is not “One Size Fits All” – it needs to be carefully crafted for the client by understanding the business direction, technology constraints, best practices in the industry, competitive landscape and most importantly the company culture. The tools, mechanics, methodology to create a digital strategy can be reused from one client to another but it takes true partnership to craft a digital vision for a client which will result in an actionable roadmap rather than a document that never gets looked at. Leave a comment, start a discussion, make a noise … after all we are in the hot seat and poised to shape the future of business and technology!